I recently reread (via audiobook) Mansfield Park by Jane Austen, one of my favorite Austen novels–although it rather surprises me that it is a favorite! As sometimes happens, rereading gave me a few more insights. Our heroine is Fanny Price, a penniless child taken in by her wealthy aunt and uncle, Sir and Lady Bertram at Mansfield Park. She grows up beside her cousins, becoming particularly close with Edmund. As all the young people reach adulthood, Austen takes us through courtships and scandals of the Bertram family and their possibly questionable friends Mr. and Miss Crawford. It’s a bit difficult to summarize Austen, because it’s not really a plot-driven book. I freely admit that Mansfield Park meanders–or perhaps I should say it strolls along a country lane. The book is a long series of incidents of family life, all of which last longer than they would in a modern novel and often only vaguely build upon each other. And yet–it’s just such a pleasant read! I like an exciting story too, but sometimes a country stroll is very appealing. I’m also fond of Austen’s style. It’s rather soothing. Long words, longer sentences, and a long time to get to anything–but it’s leisurely. I found Austen surprisingly easy to follow on audio, which I had doubts about because I have sometimes found Austen’s big cast of characters, mostly identified by last names, to be challenging. It may have helped that I’d read this before (though forgotten great swathes), but in any case I didn’t have any trouble following the thread. The real reason it has surprised me in the past to like Mansfield Park is the question of Fanny. I’ve heard Fanny, along with Emma, described as Austen’s least likable heroines, and it’s true I’d rather hang out with Elizabeth Bennett or Catherine Morland. But I actually like Fanny too. She’s not the type of heroine I usually like–she’s timid, passive, and self-effacing to an extreme. After one reading the only explanation I could find for why I liked her anyway was that I understood why she was that way, after growing up in a family that always treated her as of secondary (at best) importance. Rereading gave me more insights. The first is that, while Fanny is not my favorite type of heroine, she does resemble one of my other favorite character types. I always feel sympathetic towards child narrators who are not appreciated by the adults around them. That’s exactly what Fanny is, although she grows up after the early chapters. I also realized I wasn’t giving Fanny enough credit. She may be timid, but she is strong in her own way. She has a strict moral code and sense of propriety that she never breaks. Some of the codes of the Georgian era seem ridiculous or repressive now, but I still have to give Fanny credit for maintaining her own beliefs. Also, even more significantly, Fanny holds her ground against a marriage proposal she doesn’t want to accept. It’s in her nature to put everyone else’s wishes above her own (to a self-damaging extent), but that makes it even more impressive that she doesn’t give way when the chips are down and the stakes are high. When it really matters she shows strength, even harder because it’s such a departure for her. Finally, while I love a good fierce heroine, Fanny does embody empathy, kindness and commitment to her own morals–and while those shouldn’t be the only values women are known for, they shouldn’t be thrown out in the rush to embrace others. So there’s my best analysis on a heroine I was surprised to like. Fanny is never going to be the feminist inspiration that Lizzie Bennett is, but I like her all the same. 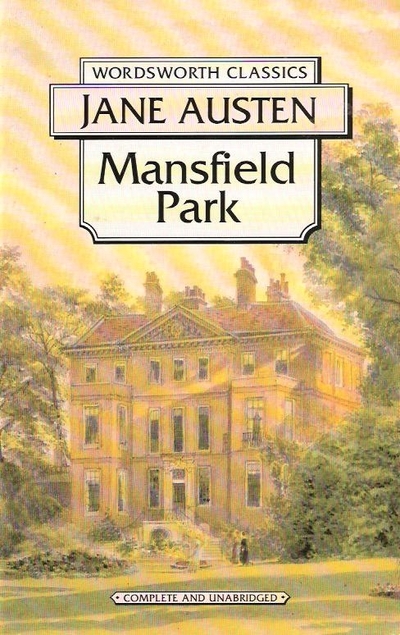 Mansfield Park is very unlikely to give you thrills and chills, but if you feel like a leisurely stroll through some pleasant scenery, I recommend it. I’m sure there are more, but that’s what I found quickly. Anyone else? Sound fun, and even a tad escapist during these trying times in the “real world.” I like your detailed analysis of the heroine.